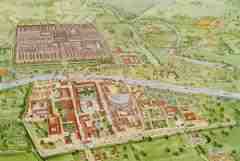 York (a city in northeast England) was founded in 71 AD as a Roman fortress town called Eboracum. It served as a base of operations to defend the Roman frontier, extend the Roman empire north into what is now Scotland and support the legions assigned to Hadrian’s Wall. When the Romans departed from York and all of Britain 350 years later, the Anglo-Saxons occupied York for another 350 years until the Vikings arrived. Eoforwic (York’s Anglo-Saxon name) fell to Scandinavian invaders in AD 866. The Vikings kept what they could use, including the ancient Roman walls which they could still use for defense. Viking Jorvik became the commercial and trading center of the Norse kingdom of York which was under the Danelaw (the body of laws that governed the area). The city was well-planned with a new bridge over the River Ouse and a new main street-Micklegate. The windowless one-story post and wattle houses were a standardized size (about 14’ x 44’) with dirt floors and small yards set off by fences. York returned to full English control when the last Scandinavian king, Eric Bloodaxe, was expelled from Jorvik in AD 954. When the Normans conquered England, York was feared as a center for fomenting rebellion. As with Vindolanda, the York dampness preserved some of the homes and contents—fabric, leather and wood items—have been discovered. 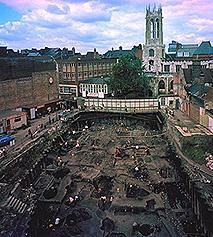 As the excavations were completed, the city created elaborate expositions that are a very popular tourist attraction.